Sherborne Festival Chorus is a non-auditioning community-based choir of 140 people, created in 2006 by John Baker on behalf of Sherborne Abbey Festival, to enable and encourage local people to sing to a high standard within an informal environment. It aims to provide more local people with the opportunity to perform in Sherborne Abbey and to involve members of the community in Sherborne Abbey Festival. 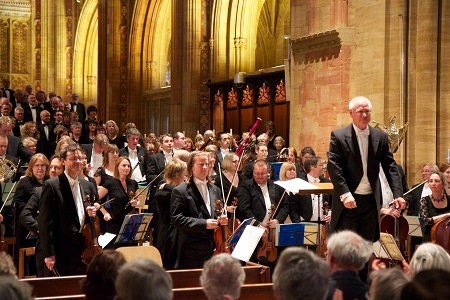 The Chorus is led by a professional conductor, Paul Ellis, who has a reputation throughout the region for leading amateur choral music of a high standard. It meets for weekly rehearsals and occasional workshops during the three months prior to the concert. The choir’s inaugural concert of Haydn’s Creation in April 2006, with professional soloists and orchestra, was highly acclaimed. The feedback, from members and audience alike, was very positive and there was great enthusiasm for continuing the choir as a regular group. In May 2007 the choir gave its second major concert, of Elgar’s Dream of Gerontius, and in 2008 a celebration of British music commemorating the fiftieth anniversary of Vaughan Williams’ death, including a performance of A Sea Symphony and his Serenade to Music. A sell-out performance of Messiah followed in 2009, with soprano Emma Kirkby included in the line-up of soloists, and in 2010 a memorable performance of Elgar’s The Kingdom. In May 2011 the choir performed Holst’s Hymn of Jesus and Poulenc’s Gloria and in 2012 Mozart’s Mass in C minor and Haydn’s Te Deum in C. 2013′s concert programme was the Verdi Requiem. See the Festival history tab for details on our programmes through the years. Visit the Sherborne Festival Chorus website to find out more.